I have been collecting bits and bobs for when the MESSY STUDIO is finished, some are big pieces of furniture that are being renovated. (I will do some before and afters later). Some are amazing trades, that I am so excited about I might detonate! Some are small but full of whimsy and wishes. 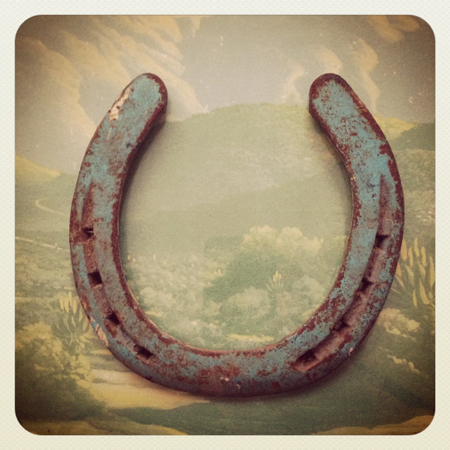 Bought this gorgeous rusty blue lucky horseshoe while we were in the Midlands. Also bought the print behind it, it is part of a collection that we have been amassing for ages and which will have pride of place on the left wall of the MESSY STUDIO.